This elegant blend, crafted from classic varietals, displays red fruit aromas of blackberry and rasberry with subtle undertones of plum and cassis. This wine has a lively aromas of mulberry and cherry, intertwined with whiffs of vibrant rasberry.Beautifully balanced by layers of dark fruit and oak spice flavours with a well defined tannin structure, ensuring a lingering after-taste. Grapes originate from Swartland and Perdeberg in Agter-Paarl. Grapes were picked at 24.5 degrees Balling. Sorted, destemmed and crushed. Fermentation took place with selected yeast accompanied by pump-overs and punch-downs at 28 degrees Celsius. 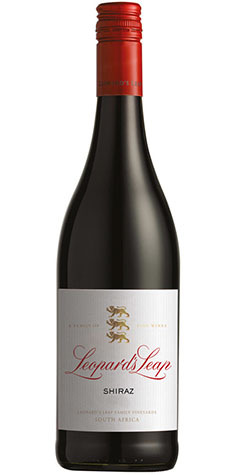 Leopard’s Leap was conceptualized at the turn of the century by winemaker and businessman Hein Koegelenberg. Situated in South Africa’s prime Winelands area, Leopard’s Leap Family Vineyards boasts comprehensive, modern premises, neighboring the town of Franschhoek, the gourmet capital of South Africa. Alongside its primary role as a wine producer, Leopard’s Leap has developed rapidly as a tourist destination with an attractive offering. Visitors can get close to the values of the Leopard’s Leap brand and experience the Leopard’s Leap identity and principal passions – wine, food, conservation, and literature.